a. CUTRINE-PLUS is U.S. E.P.A. registered for use in drinking water reservoirs, farm fish and industrial ponds, golf course water hazards, lakes, fish hatcheries and raceways, irrigation water conveyance systems such as canals, laterals and ditches. b. CUTRINE-PLUS is far less corrosive to equipment and other metal surfaces than other chelated copper compounds. c. CUTRINE-PLUS treated water can be used for swimming, domestic uses and livestock watering immediately after chemical application. d. CUTRINE-PLUS treated water from lakes, ponds, irrigation systems and golf course water hazards may be used to irrigate turf, fairways, putting greens and ornamental plants. e. Fish can be caught and consumed immediately after CUTRINE-PLUS application. f. CUTRINE-PLUS will not plate-out or precipitate under normal storage conditions nor does the copper in CUTRINE-PLUS precipitate out and become ineffective in alkaline or hard water. 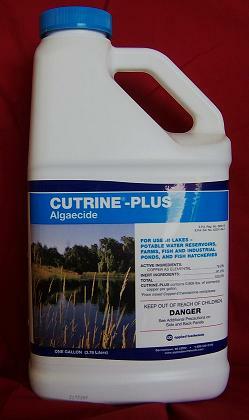 g. CUTRINE-PLUS has been used successfully in trout ponds which contained cold, hard water. h. CUTRINE-PLUS is available in two formulations (liquid and granular) for controlling floating, suspended and bottom-growing types of algae. i. CUTRINE-PLUS effectively controls the noxious submersed weed, Hydrilla verticillata, without requiring post-treatment water use restrictions associated with other herbicides. j. CUTRINE-PLUS is compatible in tank mixes with the aquatic herbicides Weedtrine-D, Reward and Aquathol K.
k. CUTRINE-PLUS can be applied to flowing water using a continuous delivery drip system. It has been used effectively in trout raceways and irrigation canals. Cutrine-plus is available in individual one gallon bottles or by the case. Each case contains four one gallon bottles.